SINN FÉIN PRESIDENT Gerry Adams is standing by his controversial comments at an event in New York last week in the face of criticism from media and journalism representative groups. His comments have been condemned by two senior ministers today with the Tánaiste Joan Burton telling the Dáil that they represented “a barely concealed threat to the modern media of the consequences of interfering with powerful men”. Adams told the audience at the Sheraton Hotel in Manhattan last Friday: “Mick Collins’ response to the Independent’s criticism of the fight for freedom was to dispatch volunteers to the Independent’s offices. The remarks prompted laughter from the audience and have been widely criticised in recent days, including by the National Union of Journalists. Joan Burton: I want to ask Deputy Adams to withdraw and apologise for these remarks and remove veiled threat to our free press in Ireland. This morning, the Justice Minister Frances Fitzgerald said that Adams’s remarks were “abhorrent”. “It is abhorrent to use imagery like that in this day and age. This is a democracy and we use democratic means to deal with issues,” she told reporters in Dublin. The World Association of Newspapers and News Publishers, which represents 18,000 publications in more than 120 countries, has now called on him to withdraw the remarks. But in a short statement issued last night, Adams said he would not be withdrawing the comments. He said that anyone who read the script for the speech will “understand the absurdity of the Independent Group’s campaign,” referring to the Irish Independent and Sunday Independent’s focus on his comments in recent days. 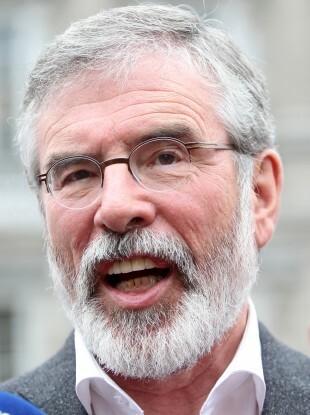 The Sunday Independent described Adams’s remarks as a “sick joke” over the weekend. Email “Gerry Adams's gunpoint comments 'a barely concealed threat to the modern media'”. Feedback on “Gerry Adams's gunpoint comments 'a barely concealed threat to the modern media'”.